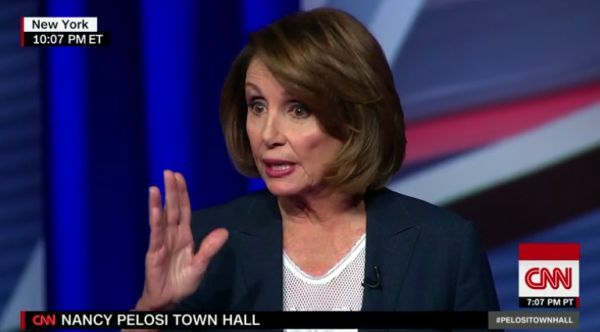 Nancy Pelosi’s feisty, candid and pragmatic words to Harvard students on Tuesday reflected the House Democratic leader’s full adaptation to the role of designated dart board for House Republicans. She granted full absolution to party hopefuls who think they’ll enhance their chances of winning by promising not to elect her House Speaker. She does, and her implications are clear. Republicans want to get rid of her because she’s effective. Sexism is a big reason for her starring role as an ogre in GOP advertising. And while Democrats should say what they need to say now, they’d do well to be wary of deposing her in response to pressure from the other side. She didn’t mention President Trump until well into the conversation, emphasizing instead the Democrats’ core promises: to hold down health care costs; to enact campaign-finance reform and other democratizing political changes; and to implement a big infrastructure program that Trump himself might back. At the same time, she stressed that she wants the “documentation” from Special Counsel Robert Mueller’s investigation to be “preserved” so Congress and the public can have “the documents and the truth.” If there is a case for impeachment, she seemed to suggest, it will emerge from what Mueller finds, not what Democrats say. But none of this reduces the pressure she might face. According to an NBC News count in August, at least 57 Democratic House candidates have said they would not support her for speaker, reflecting in part a desire for generational change. In a party that increasingly leans on younger voters, Pelosi is 78; the No. 2 Democrat, House Whip Steny Hoyer of Maryland, is 79; and the No. 3 member of the leadership, Rep. Jim Clyburn of South Carolina, is 78.